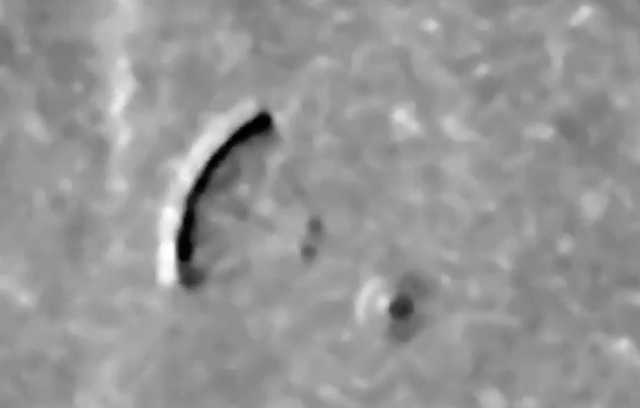 UFO SIGHTINGS DAILY: Giant UFO Near Earths Sun Puts Up Force Field To Protect It From Solar Radiation And Heat, Sep 2016, Video, UFO Sighting News. Giant UFO Near Earths Sun Puts Up Force Field To Protect It From Solar Radiation And Heat, Sep 2016, Video, UFO Sighting News. This was found by BPEarthWatch of youtube this week and its just amazing. The large black curved line is a enforced force field that protects the giant disk behind it. BPEarthWatch states, "Guys, this is something strange. It looks like a spinning disk, with snmething out in front of it." Then nn goes onto say, "when looking at the front, its closer to a shield or a cloaking device." He is spot on about that. Also know, BPEarthWatch has deleted the last big UFO video about Nibiru for unknown reasons. Probably got nervous of the US gov, so you might want to make a back up of this amazing video for your own records.